The Kitalpha project is a proposed open source project under the PolarSys Top level Project. The objective of UML is to provide system architects, software engineers, and software developers with tools for analysis, design, and implementation of software-based systems as well as for modeling business and similar processes [UML 2.5, FTF]. The ISO/IEC 42010 standard defines requirements on the description of system, software and enterprise architectures. It aims to standardize the practice of architecture description by defining standard terms, presenting a conceptual foundation for expressing, communicating and reviewing architectures and specifying requirements that apply to architecture descriptions, architecture frameworks and architecture description languages. Multiple tools implement such standards. At Eclipse, UML2 and Papyrus implement the UML standard. While it would be possible to implement the ISO/IEC 42010 standard with a UML tool, no Eclipse or PolarSys component has natively implemented it yet. Kitalpha is a modeling component which implements the ISO/IEC 42010 standard for system description in system and software engineering. It provides both a development and runtime environment to create and execute rich MBE (model-based engineering) workbenches (e.g., edition with diagrams, documentation, import/export, model transformation / analysis / validation) for system / software architects and engineers in small- to large-scale projects. For reusability, the development environment contains a kit of MBE core components, i.e. a set of engineering bricks common to different variants of MBE workbenches such as a semantic browser, impact analyzer, or import/export functions. Conforming with this standard, an MBE workbench is an architecture framework which aggregates viewpoints clearly separating concerns (e.g., performance, safety, security, cost). A viewpoint is an engineering extension which comes with its own metamodels, representations (e.g., diagrams, tables, user interfaces), rules (e.g., validation, analysis, transformation), services and tools to address an engineering specialty. Consequently, an MBE workbench is the result of a flexible assembly of core viewpoints extended by new ones which are, in the context of co-engineering, appropriate and valuable for specialty engineers. The set of all the viewpoints defines the complete description of a system. 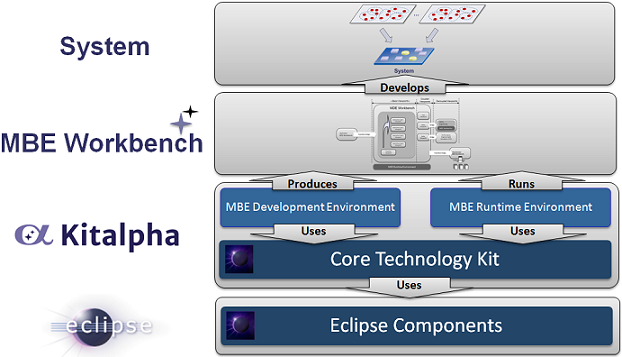 The Kitalpha development environment also provides MBE core components to develop complete MBE workbenches, for instance for the functions of import/export (e.g., for data exchange with MBE workbenches or specialty tools), model transformations with traceability, or html documentation generation. Kitalpha potentially has the ability to implement architecture framework standards (e.g., TOGAF/MODAF) but also proprietary method or domain workbenches. This rest of this section describes the key features of Kitalpha. Kitalpha can be considered as a meta-tool. The following picture presents the different working contexts with regard to Kitalpha. Finally, Kitalpha is built atop Eclipse and mainly uses modeling components. An Engineering Layer which is a set of components and services for developing and executing MBE workbenches. This layer contains all the architecture framework / viewpoint metamodels, DSLs with their representations, and services (Cf. section about the Kitalpha services). A Core Technology Kit (CTK) which is a set of technical components and frameworks required by the Engineering Layer. The CTK is dedicated to host a set of added-value technological components which are not provided by Eclipse components or to adapt existing tools for a specific purpose (e.g., adaptation of the standard EGF factories). A substantial tool or set of tools can be grouped in a Kitalpha sub-project for a better partitioning and decoupling of the sub-components development lifecycles. The ISO/IEC-42010 standard is intentionally general in order to be open and declined into multiple implementations. The following parts present the choices made to implement the standard. Moreover, a viewpoint inherits and aggregates viewpoints. Kitalpha provides both development and runtime services to define, use and manage architecture frameworks and viewpoints. For Architecture Framework (AF): 1) definition of an AF, 2) generation of AF artifacts, 3) packaging of AF artifacts with the viewpoints it aggregates. For Viewpoint: 1) definition of a viewpoint, 2) generation of viewpoint artifacts, 3) packaging of viewpoint artifacts. Strengthening the PolarSys and Engineering Eco-system by enabling the creation of rich Model-Based Engineering workbenches at a very low cost. Providing an open-source implementation of the ISO/IEC-42010 standard. Being an enabler to provide viewpoints among the PolarSys community. Unleashing the potential collaborations with other partners and projects in a healthy environment. Xtext to textually define architecture frameworks and viewpoints. Sirius is used at development time (e.g., for a graphical rendering of the architecture frameworks and viewpoints, or documentation) and runtime (e.g., for edition with diagrams in MBE workbenches). Ecore Tools 2+ for edition of viewpoint metamodels. EGF to mass-produce architecture framework and viewpoint artifacts from textual descriptions. Each aspect of a viewpoint description is generally implemented by at least one Eclipse / PolarSys component. For example, OCL can be used to express constraint rules. 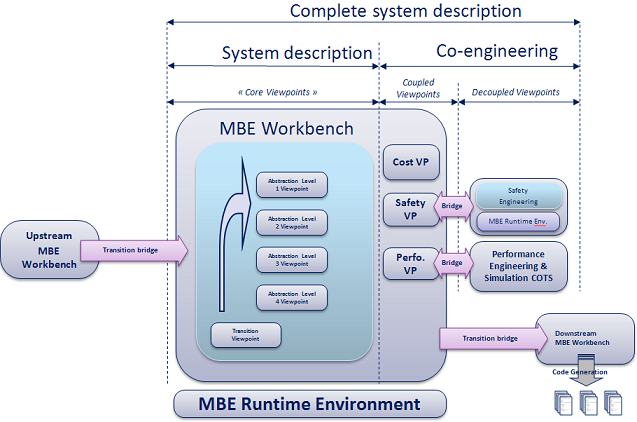 The development and runtime environment to create and execute MBE workbenches. The runtime environment limited to the core services listed in the section of Kitalpha services. All contributions will be distributed under the Eclipse Public License.